The Showersave Linear Drain sits perfectly in our portfolio of energy recovery systems. It is wonderfully simple and brilliantly designed while working in a similar way to our existing, proven vertical systems. Instead of flushing valuable energy straight down the drain, the Showersave Linear Drain helps plug the last gaping hole in an otherwise perfectly insulated home. 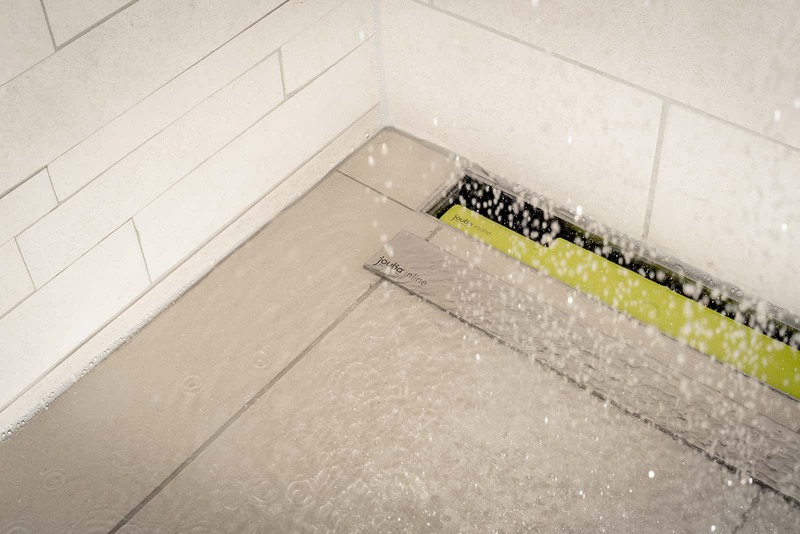 The Showersave Linear Drain is suitable for Apartments, bungalows, Retrofit in bathroom refurbishments and wet rooms. The Linear Drain works in the same way as our Vertical System . With the Showersave Linear Drain, heat recovery is straight forward. This scalable heat recovery module is invisibly integrated into a slim channel in the shower floor, and efficiently recovers heat energy from the warm shower water as it goes down the drain. All parts of the heat exchanger can easily be cleaned, serviced or even replaced. For cleaning you can simply remove the green trap cover to access the heat recovery module. Any residues can by easily removed by using a brush and mild detergent. All components of the Linear Drain technology were developed according to the test criteria of KIWA as well as of SVGW, and are registered there for certification. The integrated trap meets the requirements of EN1253. Simple to install in single storey dwellings, especially apartments.